If you have not read at least the latest of the two (and more) posts on this election, you may need to do so before this one will make sense. I am looking for ways to visualize the relationships among Fatah, Hamas, and the independent candidates in the (mostly) multi-seat districts of the nominal tier of the Palestinian 2006 election. The question is to what extent Fatah may have cost itself seats–maybe even an achievable plurality–by “overnominating”. If a party overnominates, it has more candidates than its votes allow it to elect. In this case, because the voter could cast up to M votes (where M is the magnitude of the district), a party can nominate M candidates and be OK, provided it gets its supporters to cast all their M votes for their M candidates. However, if there are independents (or candidates of other parties) who appeal to the same block of voters, a party might see attrition of its voters and fail to elect as many as it might have with fewer candidates. The problem is that there may be a “camp” of Fatah plus Fatah-rejected independents, the latter having been denied the party endorsement but deciding to run anyway. The first graph shows the total vote share of independents in each district on the vertical axis. On the horizontal axis is the party’s ratio of nominal to list votes in the district. That is, the sum of all the party’s endorsed candidates, divided by the party’s list votes. The red line is the local regression (lowess), and we have separate graph panels for Hamas and Fatah. From this graph, it seems there was attrition from both parties to independents, albeit only sometimes in the same districts. (For example, in Tulkarem, where the vote share for all independents combined was around a third, Hamas had a much lower ratio than Fatah; the latter was at over .9.) It certainly is the case that both parties have a lower ratio where the district’s share of independents is greater, but there is no question that Fatah has a stronger relationship between the two variables. So, yes, it seems like Fatah may have seen more attrition from list to nominal for its candidates than did Hamas. However, I was surprised at how much a relationship there was for Hamas as well. The second graph is a box-and-whiskers plot summarizing the distribution of a “candidate ratio” across both major parties in each district. Above each district abbreviation there are the numbers 2, for Hamas (Change and Reform) and 3 for Fatah. The candidate ratio needs a little explanation. First, I start with a magnitude-adjusted vote share for each candidate. This is their individual votes, divided by V/M, where V is the total number of nominal votes cast in the district and M is the magnitude. This way, we can normalize the shares across districts of varying magnitude. Then the ratio–what is actually being graphed–is this magnitude-adjusted candidate vote share divided by the party’s list votes. The purpose of this mathematical gymnastics is to get an idea of how much each individual candidate of a party deviated from the party list vote in the district. Thus where the box or whisker or an individual outlier point is above 1.0, it implies a candidate more popular than the party in the district, and where it is less than 1.0, the candidate ran behind his (rarely her) own party. 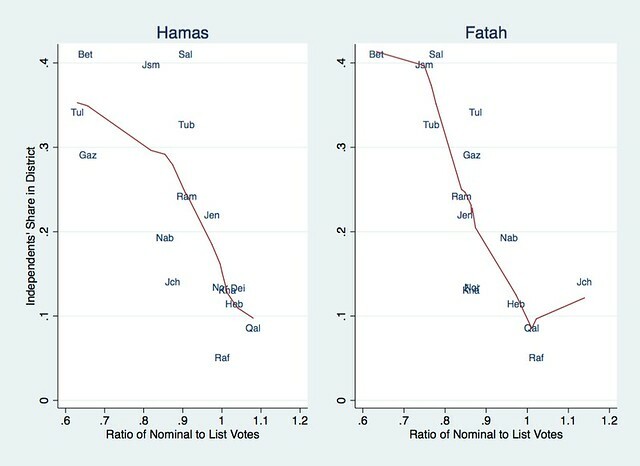 I had previously noted that the standard deviations of individual candidates’ votes were pretty small for both parties, but greater for Fatah. This is clear here, in that the “whiskers” are farther from the box for Fatah (party 3) than for Hamas in most districts. This is especially so in Jerusalem (Jsm). And all the Fatah candidates ran quite far behind their party in Bethlehem. In fact, I think the “two slates” thesis–that Fatah (or more precisely the “Fatah camp”) shot itself in the foot by nominating an extra set of candidates–really rests on these two districts. There is rather less evidence for it elsewhere. However, one can still see that, in general, Fatah candidates seem to run a little farther behind their party than do Hamas candidates, and most of the cases of the candidate ratio being over 1.0 for an entire party are Hamas. The final graph is a little bit overwhelming, I know. But I wanted to plot all the candidates’ individual votes. Here again, I am using the magnitude-adjusted vote share. The constituencies are indicated by numeric codes (because that is the only way I could (think of to) do it in Stata), but I made sure they are in the same order as they appear in the second graph. This version has “jittered” data points so that it is easier to see where two or more candidates were very close in votes. This is helpful, given the low intra-party deviation. The original, un-jittered, version is still on my Flickr site. Rather than draw firm conclusions here, I just want to put the visualization of the data, by these three different but related means, out there for folks to comment on. Maybe someone will see patterns beyond those I pointed out. * There are two of these in Bethlehem, with nearly identical vote shares, and two in Jerusalem; in addition, one of the independent winners in Gaza City is a Christian whose votes, it might be noted, are higher than any Fatah-affiliated candidate. He is the third ranked independent winner in that district. ** If so, that would have been even better reason to give the official endorsement to fewer candidates, thereby allowing some in the camp to appeal across party lines. Key to districts, their codes (in the third graph), abbreviations, and magnitudes (in that order). Did Fatah over-nominate, and thereby cost themselves a majority in the Palestinian Legislative Council election of 2006? I have previously cast doubt on such claims, because Fatah had no more candidates in any district than the number of seats being elected. My understanding of over-nomination in a system where voters have M votes (M being the magnitude; i.e. the number elected in the district) would be a party having more than M candidates. By this standard, no, Fatah did not over-nominate. However, this could be too narrow a view of over-nomination. We might want to include broader definitions of “camps” in our definition of the political tendencies that have potentially too many candidates. I have ignored the independents before, because I have no information on them, and no way to know whether they were in any way affiliated with Fatah or any other party or movement in the election. 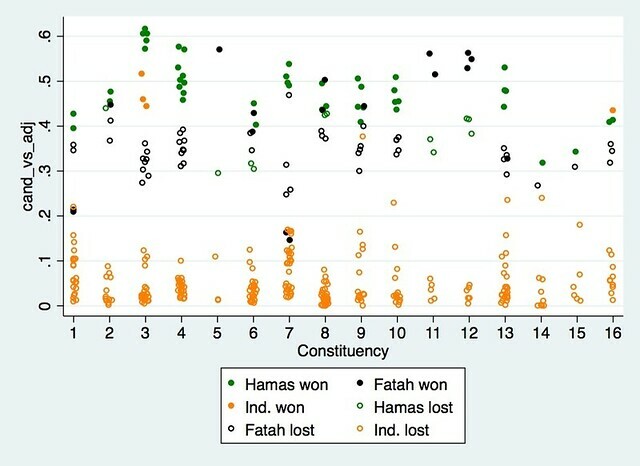 A paper prepared back at the time by Jarret Blanc for IFES, “Palestinian Election Analysis: How Hamas Won the Majority“, has now come to my attention. The paper itself is no longer available on the IFES website. However, it is cited in Hamas: The Islamic Resistance Movement by Beverley Milton-Edwards and Stephen Farrell,* which I just finished reading. (I recommend it highly, by the way.) The authors cite Blanc’s finding that the number of additional legislators that Fatah could have won with greater unity was 18. So I went back to my dataset on the election and attempted to replicate this. I made the following assumptions: (1) every defeated independent’s votes would have gone to a defeated (official) Fatah candidate, and (2) the votes would have followed the candidates’ actual ranks in votes in the district (i.e. the first losing independent’s votes would have gone to the first losing Fatah candidate, the second to the second, etc.). Note that these assumptions represent extreme leaps of faith! But without further information I can’t do much better. ** If we do this, how many of the Fatah candidates now win, given their “revised” higher vote totals? I get 17. So my count essentially agrees with Blanc’s, which I assume was determined with some actual knowledge of the independents’ affiliations. So did Fatah over-nomiante? Technically no. It nominated M official Fatah candidates per district in a system where voters could cast M votes. Moreover, as noted in the previous post on the topic, the party’s actual candidates typically did not deviate much in votes from one another, implying a fairly strong party orientation of its voters (albeit weaker than that for Hamas) around the candidates it actually endorsed. Did it nominate badly? Maybe. But this is again down to the electoral-system design. In systems where nominal votes are decisive–as in the districts of the Palestinian electoral system–it is inherent to the system design that independents can run, that candidates can make personal appeals distinct from party label, and that some individual candidates may prove less popular than the party as a whole. The party needed to figure out a way to manage these personal factors before settling on candidates, and Fatah may have failed to do so. It does not follow necessarily that it should have run fewer Fatah-branded candidates, and there is always the possibility that had it given the party nod to some of the independents then some of its actual candidates might have run as independents instead. None of this reconsideration of the original thesis changes the fact that Change and Reform won more votes–on the party list as well as for its candidates–than Fatah, and that the electoral system magnified the lead of the party whose candidates won the plurality. But it is possible that poor internal practices might have prevented the Fatah “camp” from converting its full pool of potential voters into seats. Too bad they did not opt for an open-list PR system. Even SNTV would have been better for them. * It was actually Andy Reynolds who, upon reading my earlier post, mentioned Blanc’s paper and the possibility of over-nomination. I was already reading the Milton-Edwards and Farrell book by then, and happened upon their citation to Blanc several days after Andy mentioned it. Some other points from the Milton-Edwards and Farrell book are worth quoting. The quote within the quote is from Dr Nashat Aqtash, “a Nablus-born public relations expert”. Of course, I agree entirely, although I would again point out that the deviation of a party’s candidates’ votes shares would be expected to be higher than it was if personal factors were really a large factor. Still, the deviation was indeed higher in most districts for Fatah than for Hamas. The authors also offer support for something I warned about in a post at the time, warning we should not believe the exit polls: many respondents may simply have lied to exit-pollsers. They suggest this may even have been something Hamaas told its supporters to do. Is Gaza one of the densest places on earth? I wish I had kept count of the number of times in the last month I have read or heard that “Gaza is one of the densest places on earth”. This statement is usually made without any context whatsoever. (I heard one person on BBC cite an actual figure, but not how it compares to anywhere else.) So is Gaza one of the densest places on earth? Of course, the answer depends on your definition of “place”. That is, compared to what? 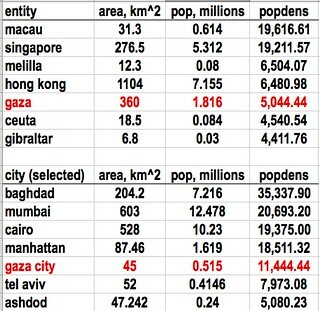 The table below compares the Gaza Strip first to several other enclaves, exclaves, or small territories, which would seem to be a relevant comparison group. Then it compares Gaza City itself to several other major urban areas, including a few in the Middle East. While the list of ex/enclaves may be close to exhaustive, obviously the second one is not. The claim is pretty hard to sustain when one checks the facts. In area, the Gaza Strip is similar to Singapore. But the latter is almost four times as densely populated. In terms of density, Gaza is close to Hong Kong (which is overall bigger) and Ceuta and Melilla (which are overall much smaller). But it doesn't seem that Gaza is one of the most densely populated small territorial entities on earth. So maybe commentators who make this remark mean compared to other urban areas. (I do not think they mean this, because the references always just say "Gaza" in a context that seems to mean the territorial exclave, not a specific city within it, but for the sake of argument…) Based on the second set of comparisons this, too, looks hard to sustain. Yes, 11 thousand people per square kilometers is dense, but Gaza City is no Baghdad or Cairo or Manhattan. I am not attempting to make a political point here (I know, hard to believe!). In fact, I have heard apologists for both Hamas tactics and Israel's actions make the claim. As, in "How can Hamas not operate among civilians when Gaza is one of the most densely populated places on earth?" Or "How can Israel avoid killing civilians when Gaza is one of the most densely populated places on earth?" To be fair, there are specific places within Gaza that are incredibly dense. And some of these are indeed places where Hamas is active, and thus so are they places that the IDF hits hard. For instance, Jabalia has over 1950,000 people in 1.4 sq. km. But again, the media comments I have read and heard do not say "Jabalia is one of the densest places on earth" (and I do not have any idea how it would actually compare with similarly geographically compact locations). They say "Gaza" is. Evidently not. I wrote about the 2006 election for the Palestinian Legislative Council quite a lot at the time. For instance, as exit poll results were coming in, I warned not to believe their reported lead for Fatah, and indeed they quickly proved inaccurate. Once the results were in, I noted that the magnitude of the Hamas sweep was a product of the electoral system. In light of recent events, I decided to go back and take an even closer look at the results of that election in January, 2006, which turned out to be not the prelude to a period of calm while Hamas figured out how to use a legislative majority and the near-majority of cabinet seats it received in a unity agreement more than a year afterwards, but a prelude to three major flare-ups of violence between Hamas and Israel. More specifically, I was prompted to go back and look by a remark in Peter Beinart’s article in Haaretz, entitled “Gaza myths and facts: what American Jewish leaders won’t tell you“. The piece itself makes some decent arguments, although I think Beinart is selective in his facts to a degree that is not entirely distinguishable from these apparently monolithic American Jewish leaders he refers to. However, let me stick to the one set of facts I do know something about: the distribution of votes and party strategy in the 2006 election. Fatah did indeed run more than one candidate per district because, well, districts (most of them) elected more than one seat. Hamas did the same, and it did not hurt them. In fact, this was a system in which voters had the possibility to vote for as many candidates as there were seats in their district. Parties could not pool votes, voters could not cumulate nor could they just select a party. (I am not speaking here of the totally separate closed-list PR portion of the electoral system, and from the context I presume neither is Clinton.) A party would win all the seats in a district if it ran a candidate for every seat, and if its voters gave all their votes to candidates of the party. And, of course, if its candidates had the top-M vote totals, where M is the magnitude (number of seats being elected in the district). It was actually Hamas that did not always run M candidates. However, the places where it ran fewer were either where some of the seats were set aside for Christians (not surprisingly, Hamas, the name of which is an Arabic acronym for Islamic Resistance Movement, did not contest the Christian seats), or where the seats it did not contest were won by independents. 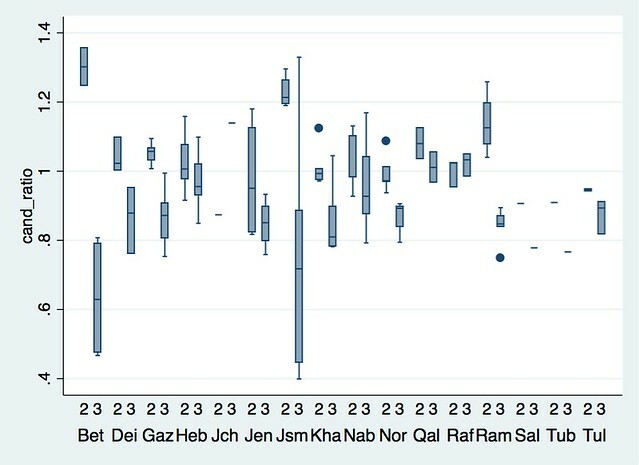 For instance, in Gaza City, eight were elected (M=8). Hamas ran five candidates, Fatah ran eight. Hamas elected all its five, and Fatah elected none. But the reason Fatah did not elect anyone was not that it had too many candidates. The other three seats went to independents. One of these was a Christian, for a set-aside seat. The other two were independents whose vote totals were more than 11,000 votes higher than that of the most popular Fatah candidate. These independents may have been “quiet” Hamas affiliates not bearing the label. One, Jamal Naji El-Koudary, is an academic at the Islamic University of Gaza. Not much difference, but enough to make a difference in some places. But this does not mean that Fatah’s running of too many candidates was the reason for winning fewer seats. In this type of electoral system (what I like to call Multiple Non-Transferable Vote, but others call Block Vote), a higher standard deviation can help you win more seats than you otherwise would, in cases where your party overall ranks second. That is, some of the districts where Fatah elected some candidates despite Hamas having one or more candidates with higher vote shares were precisely where it had individual candidates who were more popular than the party as a whole. For instance in Nablus (M=6), Hamas ran five and Fatah six. The winners were all five Hamas and one Fatah. An independent (Hamas-affiliated?) was the second loser, just behind the second Fatah candidate. The one Fatah candidate who won had 39,106 votes, whereas the party’s next highest vote-earning candidate had 35,397. The five Hamas candidates had from 44,957 to 36,877. The most important point here is that Fatah could not have won more seats simply by running fewer candidates. This is not a single-vote system (like SNTV or like the US primaries Clinton referenced) where running multiple candidates can split your vote. Had Fatah run fewer candidates, its voters would have cast either fewer votes or given the remaining votes to other parties’ candidates, or to independents. It could have won only by running candidates who could beat a Hamas candidate–getting more than the 36,877 won by the district’s sixth-ranked candidate. Fatah’s biggest problem was that it just was not as popular. Its collective vote total for candidates was higher than that of Hamas in only six districts out of sixteen. And some of those where it was in second place were the bigger districts, where even a small plurality for Hamas, combined with a low standard deviation of its candidates’ votes, would mean a Hamas sweep. Hamas won a plurality of the candidate votes in Gaza City (M=8, 32.7%-31.7%) Hebron (M=9, 51.1%-35%), Jerusalem (M=6, 33.7%-26.4%), Nablus (M=6, 38.2%-36.5%), among others. Those vote totals show that Hamas was often well short of a majority. In fact, nationwide, its candidate votes amounted to only 40.8%, but Fatah was well behind (36.6%). That is a lower vote share than in the national list vote, where Hamas won only about 44% to Fatah’s 41%. In fact, I had never summed up the nominal (candidate) votes before. I have always reported the outcome as 56% of seats on 44% of votes, but that is list votes. Given that it was the nominal tier that was the disproportional part of the electoral system, it is actually more accurate to say that Hamas won 56% of seats on not even 41% of votes. It does not change (or reform) the outcome, but it underlines just how disproportional the system was. A non-proportional electoral system of mostly multi-seat districts sure can turn a small plurality into a big majority. Hamas was more popular, but well short of a majority. The electoral system mattered in a big way, but Fatah’s running multiple candidates was in no sense the reason why Hamas won. None of this helps resolve the current dreadful crisis, but it does resolve that Peter Beinart, while attempting to counter “myths” with “facts” is perpetrating a myth of his own–as is Bill Clinton–that running too many candidates was what doomed Fatah. That is simply incorrect. * There was initially a split slate, but party registration was actually re-opened to allow Fatah to present a unified slate for the actual election. ** In most cases, both Hamas and Fatah had higher list than nominal votes. Although there were several small parties running lists that did not have candidates (at least not labelled), there were many independent candidates. Only 4 of them won, and most others were not close to winning. (Their mean ratio of votes to the district’s last winner was .127, and only one had a ratio greater than .66.) They did, however, combine for 20.7% of all nominal votes cast. I can’t rule out that some of them drained votes from Fatah candidates, although that is not Clinton’s and Beinart’s claim. They claim there were too many Fatah candidates. Data source: Central Elections Commission – Palestine. I used Adam Carr for the district-level nominal votes, because his page was formatted in a way that was more easily transferred to spreadsheet format. I verified that it matched the Commission’s data, and corrected a few examples where it did not. I typed in the list votes per district. I generated various summary statistics and analyses in a Stata file. According to [former PA negotiator Muhammad] Shtayyeh the declaration of Israel as a Jewish state implies the prevention of Palestinian refugees from returning to their homeland, opening the door to the expulsion of Palestinian citizens of Israel from their homes and the imposition of the Jewish narrative on the history of this country, thereby rejecting the Christian and Muslim narratives. Yes to Shtayyeh’s first point if “homeland” means within what would become the recognized borders of Israel, but no to the second. I am not aware of any but the farthest-from-the-mainstream actually advocating expulsion of Israel’s Arab citizens. On the other hand, as best I can tell, it just assumed that Jews will be expelled from the proposed Arab state of Palestine and, of course, would have no right of return (and should not have) to the part of their homeland that becomes outside the borders of Israel. As for Shtayyeh’s “narratives” point, as far as I know, the Christian narrative–if there can be said to be one such narrative–does not deny that the land in question is the historic homeland of the Jewish people. If there is indeed a single “Muslim narrative” that denies this historic fact, then it is not an equivalently legitimate narrative. The idea of a partition is that each of the people with competing claims to the territory being divided gets its own state. I do not see how an agreement can be signed that does not recognize each state as the state of one of those peoples. Ideally, it should also grant protection to the minority, who would be allowed to remain within the borders of the other people’s state. However, Shtayyeh may be right about one thing: a partition could open the door to migration of Arabs out of Israel (less likely to be through “expulsion” as through choice amongst perceived-to-be bad options). Most (all?) partitions are accompanied by population transfers. And that is why a partition process is not really a “peace process”. Partitions, and especially population transfers, are not typically peaceful. Note also that Shtayyeh’s references to narratives refers to religions. Although some tendencies within the State of Israel blur the lines, the Jewish state is not about a religion, it is about a national group’s right to sovereignty–national liberation, in other words. This is not a small semantic matter, though it gets elided regularly by all those who have an agenda against the existence of an ordinary “secular” and democratic state in the ancestral home of the Jewish people. This is not a blog about conflict resolution, and I am certainly no expert on the Middle East conflict. Lack of expertise does not stop many other folks from commenting, so why should it stop me? The following is simply based on my close attention to the media from Israel (in English, both print and broadcast) and international sources, as well as my own observations of many of the much-discussed locales when I was in Jerusalem (in what is technically a “settlement”) for over two months in 2010. There has been much–too much–attention to the Israeli cabinet’s declaration (not really a “decision” as best I can tell) to move ahead with some 3,000 new homes beyond the Green Line (the 1949 armistice lines), including in an area known as “E-1”. Report after report says that building homes in E-1 is the death knell of a future Palestinian state. It is alleged to make contiguity of such a state impossible, by cutting off access between the Ramallah area (northwest of Jerusalem) and Bethlehem (to the south of the Jerusalem center). There is no kinder way of putting it than to say this is BS. The proposed E-1 homes are northeast of Maale Adumim, which is itself some distance east of Jerusalem. Ramallah and Bethlehem can’t exactly be easily connected even now, due to the incredibly rugged terrain. Homes northeast of Maale Adumim, a city of about 40,000 east of Jerusalem along Highway 1 towards the Jericho and Dead Sea areas, doesn’t change these geographic realities. As for the other areas in which new homes would be built, these are not new proposals. They are not even new settlements. They are in places like Ramat Shlomo, which I have commented on before. That is, they are homes within the boundaries of existing built-up areas–at least as I understand what is covered by the cabinet’s declaration of intent to proceed. They are in areas that will not conceivably be either evacuated or turned into islands within a sovereign Palestinian sea whenever there actually might be a negotiated solution. As for contiguity, it might be noted that Gaza–from which Israel did pull out its settlers—is not contiguous with the other regions that are proposed as part of a Palestinian state. So this is actually something of a red herring. If a Palestinian state is ever created, it will not be contiguous, regardless of Mevasseret Adumim (the name of the housing area within “E-1”) and Ramat Shlomo and Ariel and Kiryat Arba (etc.). It will have to involve various road and other corridors, overpasses and underpasses near developed Israeli areas, and tight security guarantees. It will also involve transferring some current territory–and presumably some Arab population–on the pre-1967 Israeli side of the Green Line to the new state. All of this is precisely what makes a negotiated solution so difficult, and nothing that the cabinet has said in recent days changes this difficult reality. It must be emphasized that all of these development plans, as well as the ideas of territorial swaps and security guarantees, have been on the table for close to two decades now–a key fact lost in the excited rhetoric of recent days. In fact, there are many influential voices in Israel, including within the cabinet itself, disappointed with the slow pace of approvals of long-planned housing developments. Israel is just now in the midst of an election campaign, and we can hardly expect the incumbent government, particularly given its political complexion, to have greeted the UN resolution “upgrading” the status of “Palestine” with anything milder than it has done so far. One does not have to be a supporter of the Likud and its allies and their strategic visions–I certainly am not–to recognize that the bluster from European governments about withdrawing ambassadors and such is not constructive, and probably only plays into the hands of the harder-line elements of the Israeli electoral majority. In context, the diplomatic and media excitement of this past week is just so much noise. So, in today’s news we learn that the Kingdom of Thailand is recognizing the “state” of “Palestine”. It makes me wonder if now the State of Israel should recognize the Kingdom of Patani.